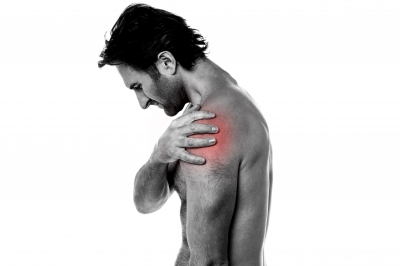 What are the causes of Shoulder pain ? Shoulder pain is common both in the general population and in those that participate in sport. It is often extremely debilitating as it will frequently interfere with sleep and as anyone with a small child will tell you, sleep deprivation will rapidly interfere with your ability to function. Often while the patient complains of shoulder pain and/or loss of movement in the shoulder, the source of the pain is in fact the neck. Therefore a prerequisite of effective assessment and management of shoulder pain is that the neck and the thoracic spine are thoroughly assessed and treated if required. Frequently in the case of the patients that present to our clinic in Eskbank near Edinburgh, this will result in the resolution of the presenting symptoms. If the neck and thoracic spine are ruled out as a source of symptoms, this then leaves the shoulder joint itself otherwise known as the glenohumeral joint, the acromioclavicular joint or the soft tissues surrounding the shoulder. This is a persistent painful stiffness of the shoulder that progressively worsens over time. In the majority of cases there is no obvious reason or cause. It is more common in those over the age of 40, women and people who have diabetes or hypothyroidism. The term rotator cuff refers to the muscles and tendons which surround the shoulder joint. They stabilise the shoulder joint, keeping the head of the humerus or the ball of the ball and socket joint in the correct orientation. When there is a rotator cuff dysfunction present, whether this tear in one or more of the muscles which make up the rotator cuff or a tendon pathology such as a tendinopathy or a tendon rupture or tear. The result will be a loss of movement, strength, pain and/or a loss of function. The resultant alterations in your abilitiy to control and stabilise the shoulder, then cause a progressive worsening of your symptoms. This is when the ball of the shoulder joint is not adequately held in place, leading to excessive movement of the ball of the shoulder joint. The can be either be traumatic, following significant trauma for example being rugby tackled or a significant fall. Or it can be atraumatic, in this case it is due to a high volume of stereotypical repetitive movements. For example in swimmers or throwers. Instability of both types is most common in those under the age of 35 years of age. There are other problems and pathologies that will occur in and around the shoulder, such as those affecting acromialclavicular joint, the sternoclavicular joint or joint pathologies such as osteoarthritis or rheumatoid arthritis. However the 3 categories outlined above are the most frequent that we see in our clinic on a day to day basis. So then what can I do about shoulder pain ? As with any musculoskeletal problem the first priority is to rule out any serious injury. Therefore if you have sustained significant trauma; whether that has been in a sporting environment such as contact playing rugby or football or in an occupational environment such as a fall from height. Then our advice would be that you attend A&E as soon after the injury as possible. If serious injury such as fracture or dislocation has been ruled out or is judged to not be a concern, then it would be appropiate for you to make an appointment to see us. What to expect from Physio? First of all the physio would take a detailed history asking various questions about your pain, other problems and your general health. They would then thoroughly assess the neck, thoracic spine, shoulder, sternoclavicular and acromialclavicular joints. This would include range of movement, muscle strength, muscle endurance and joint stability. Once a diagnosis has been established, you and your physio would then make a plan to for you to restore movement, strength, endurance and function in your shoulder. This could include appropriate manual therapy, electrotherapy, rehabilitation, and graded return to sporting or other activities. What if you don’t improve with Physiotherapy? If following appropriate rehabilitation you are still experiencing significant pain or other problems, your physio would be well placed to liaise with your GP regarding the best way forward. This would of course be done in partnership with yourself. This could involve suggesting that you have a steroid injection or suggesting referral for an Orthopaedic opinion. All of the physio’s working at the clinic have experience in working with patients following shoulder injections or shoulder surgery such as subacromial decompressions, rotator cuff repairs and stabilisation procedures. Please contact us to make an appointment at our clinic in Eskbank near Edinburgh. We can normally see you within a few days and we have appointments from 8 am to 8 pm, so we can see you at a time that is convenient for you. We don’t require you to have seen your GP if you are funding treatment yourself, therefore you can self refer. Although we would suggest that if you are planning on using your health insurance, that you speak to your insurer first. To ensure that you follow their procedure and don’t invalidate your policy. This entry was posted in Conditions we treat and tagged neck pain, Shoulder pain, Sports Injuries. Bookmark the permalink.